Being bilingual is a blessing, and sometimes a curse. While doctors of various specialties extoll the benefits of knowing two languages, while cultural specialists sing the praises of people who can communicate fluently linguistically and culturally in more than the native language, the reality of living bilingual has some very odd side effects. First, let me clarify. By my own very strict definition of bilingual, even after more than half my life in Spain, I’m not bilingual and never will be. My accent is way too obvious, though I’ve begun to suspect that’s a subconscious way of maintaining my original Anglo identity. But aside from that (and an occasional grammatical error) I’m totally fluent, including slang, puns and political rants in my second language. Most other people would consider me bilingual so let’s use that term here. But sometimes that language switch gets stuck. That’s most noticeable when interpreting, when after a while I inevitably speak Spanish to the Anglo and English to the Spaniards. Then there’s the written language. Again, usually this goes smoothly, but there are times when I cannot understand the English translation and must read the Spanish – alas, that can happen in museums or tourism sights, where the English translation is not very good (sad but true). When reading these English translations, it helps me to think in Spanish. Menus are another confusing place. My restaurant English is not very good, so I almost always read the Spanish. Anyway, there are some very badly translated menus – one of my favorite bloopers is “steak in spit” (meat on a skewer). Then there’s fast food. I really should collect all the ways to write “sandwich” in Spanish: sanwis (purely phonetical), samwis (phonetical plus grammar rule about mutating n to m), sandwhich (know-it-all who knows w always followed by h), and variations on these three (sandwis, samwich and the like). And my bilingual brain is still baffled at times by “hay sandwiches” which I’ve often tried to read as English (dried-grass sandwiches for horses) instead of part English and part Spanish, announcing the availability of bread slices with something in between. Which brings us to my new favorite, seen when dashing through Madrid’s Cuatro Caminos rotunda-square: Low Cost Come. Hmmmm. We are not in the red light district of Amsterdam, and a second / third glance clarifies that we’re talking about food. Translated, they’re talking about inexpensive food. 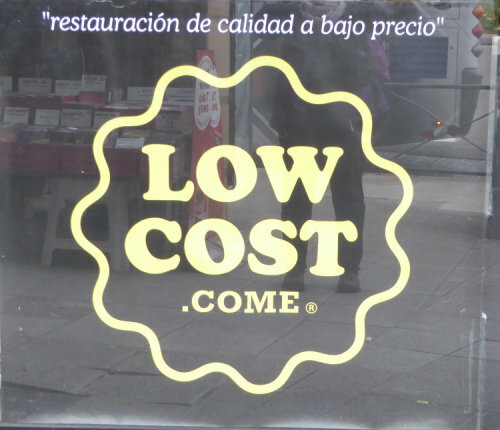 Ungrammatical even in Spanish: using “low cost” like this seems to mean it describes the next word – but the noun is “comida”, not “come” which of course has a different meaning in English. One can only guess that small window space created a need to improvise – thus the command form “come” instead of the noun. Better punctuation might help make this clear – or some indication that we are looking at two different languages. Anything else, in the situation, could lead to a bit of confusion, at least for anyone bilingual enough to notice the unusual combination of words. And no, I do not have an especially dirty mind. Just a bilingual brain. Unless, of course, this is a supremely clever marketing strategy. Perhaps I should inquire? *for a fun bilingual movie, look for Miguel y William (Michael and William), a 2007 romantic comedy about a fictitious meeting between contemporaneous writers Miguel de Cervantes and William Shakespeare and their rivalry for a lovely lady. It’s partly in Spanish and partly in English, with subtitles in whichever language is not being spoken. Not to be considered Great Cinema, but it’s entertaining and has some great Spanish scenery.